Barely two weeks ago, I used the following phrases to describe soup: “vegetables boiled to death,” “assaulted with too much cream,” “whatever healthy things in there cannot be tasted,” and even “what must have been a practical joke” about an especially awful one I’d ordered recently. I admitted that I found soup boring, and my relationship to it has been on especially unstable terms this year after repeated disappointments. We then proceeded to eat soup for dinner for the next 14 days. What happened? It turns out that baked potato soup is a gateway drug, in that when we finished it, we wanted more soup. Different soup. We swore we could stop any time we wanted, but three batches of soup later, we realize we might have underestimated the power of good soup, the kind that is filling but also freeing of the nightly “What’s for dinner?” because, it’s already made and only needs to be reheated. I’ll admit that the fear of The Swimsuit when we go on vacation in a few weeks may have also egged on this habit, but it was the soup — come on, you know you wanna! — that really kept us engaged. After the potato soup, we moved onto a tomato-y cabbage soup that we enjoyed, but I can assure you that the recipe isn’t ready for prime time and black bean pumpkin soup, one of our all-time favorites from the archives. And then this weekend, I attempted to recreated the kind of mushroom barley soup I grew up eating. Except, no offense ma, this is much much bolder. It starts with soaking dried porcini, which, understandably, is the start of something wonderful as they pack so much flavor in what looks in the store like wood chips. I blame my German half for my affection for beef broth (I don’t think my grandmother used chicken broth once in her life, even for matzo ball soup), and the combination of beef broth, porcinis, their soaking liquid, brown mushrooms and the tomato paste I snuck in there makes for a soup that literally smacks you in the face (or perhaps knocks you off your stool) with flavor. The farro (which I used because I was out of barley, but either work, as will spelt) gives you something nice to bite into, and gives it more of a main-course feel and should I want to make more of a stew-type soup, I might even double it next time. Alas, a puddle of brown soup is hard to make look like anything but. I was very tempted to swirl in a sherry cream or a dollop of dilled sour cream to pretty it up, and were I serving this for a dinner party or guests, I might. But there’s so much flavor, it doesn’t need it. For the mushrooms, you can use white, brown/cremini, shiitake or a mixture thereof. But I use all brown/cremini almost every time. Cover dried mushrooms with 1 cup boiling water, and set aside for 20 minutes, or while you prepare the rest of the soup. 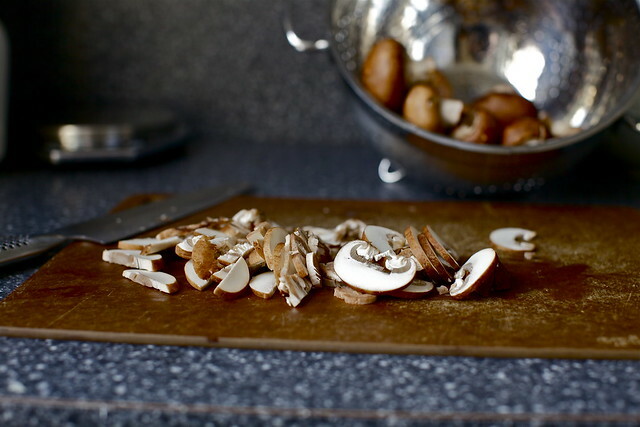 Trim and slice fresh mushrooms, then give them a rough chop to your desired texture. Heat oil in heavy-bottomed deep pot. Sauté onions and carrots over medium heat until onions begin to color, about 10 to 15 minutes. Add garlic, and sauté for 30 seconds. Add fresh mushrooms, and cook until they begin to release liquid, about 5 to 10 minutes. Raise heat and add barley; sauté until it begins to color (this didn’t really happen for me, because the mushroom liquid was still sloshing about). Add broth, sherry and tomato paste. Scoop the porcinis out of their soaking liquid (hang onto the liquid) and finely chop them. Strain the soaking liquid to remove any grit and add both this liquid and the chopped porcinis to pot. Season with salt and pepper, and simmer for about 40 minutes, until grains area tender. Stir in sherry vinegar; adjust seasonings and serve. I’ve had mushrooms on the brain lately, so I’m so glad you posted this. You’re a mind-reader! Thanks for sharing. It’s going on the menu for this week. 18″ of snow are coming within the next 24 hours. This may or may not sound delicious and by that I mean it sounds delicious. Can the sherry be nixed or subbed with anything? Or would a bottle of it last for a long time? I always seem to avoid recipes with it, but love me some soup and ‘shrooms! My Daughter suggested I make this and If I didn’ t live so far away I would have kissed her. It is definately a keeper . 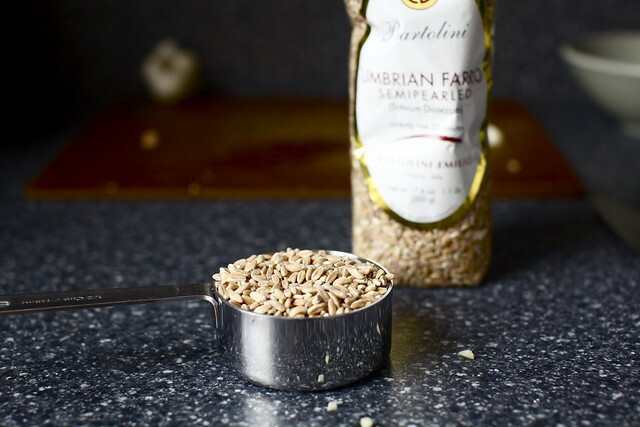 First time using farro but, my hubby and I agree , it is a fabulous grain with a nutty personality ! So thrilled to have access to your delightful dishes via the web. Long after traditional wines sour. Speaking of soups, do you have a good recipe for Italian Wedding soup?? Jessica — I’ve had my bottle of sherry forever. Not sure if its advised, but my soups have never talked back and complained! Erlyn — I have an escarole and orzo soup with meatballs, kind of a riff on Italian Wedding Soup. I also have been eating and using mushrooms a lot lately. They are a perfect winter ingredient with such warming and hearty flavor! This recipe looks great, I’ll be adding it in my notebook of recipes to try! Yum! if it wasn’t 40*C (100F) here I’d be making this soup asap. Alas, I think I’ll wait until winter. I love soup in all it’s incarnations and eat it regularly! Delish. I have been hungry for barley. Thank you! I love farro. I love mushrooms. can’t wait to make a vegetarian version of this soup! Sharon — I’ve made and delighted in Julia Child’s beef stock from Mastering the Art of French Cooking in the past; these days I’m really pinched for time and have been using Pacific brand, organic low-sodium. It’s not half-bad but if you have the time to make fresh stock, it will really show up in a brothy soup like this. I love soup, and mushrooms are the BOMB! SoupAddict cheers your coming over to the bright side of soup! Oooh! I have tomato paste leftover from the red lentil soup I made yesterday, and mushrooms, and barley!! And we’re getting 1/2″ of ice tonight – guess what we’re having tomorrow!! Guess we’re on a soup kick too! My household has really enjoyed your Black Bean-Pumpkin Soup this winter! The soup sounds very delicious, nice combination of flavours. I see you used only 1/4 cup sherry, the rest for the chef? Your too funny! I agree w your description of soups for the most part, especially the loss of ‘real’ flavour once you’ve boiled everything to death and added cream. It’s taken some real experimenting on my part to find good soup. The effort is well worth it for a really good bowl of soup! I love the flavors in this one! Love em to bits! OH. WOW. I love farro, I love soup and I love Smitten Kitchen! Ooooh. I am a big soup fan at the mo and this looks so deep and delicious. This may be my intro to farro sorted. This looks absolutely amazing. I might be forced to make a trip to the grocery store in the ice storm in order to make it! I just wanted to tell you that I made your baked eggs w spinach & mushrooms, latkes, and winter fruit salad this weekend for brunch and they were all fabulous. I could eat those eggs every single weekend — heaven. To the poster above, buy the sherry! Sherry makes almost every soup in the world taste better (especially split pea). I think the texture of perfectly cooked farro could save any soup…this one sounds divine! I have always been a soup gal, but I must’ve taken a longer break than realized, as I had friends and the hubs both requesting more soup. Yesterday I decided to make a big batch and almost went for a mushroom barley, but decided on a revved-up vegetable. Now I realize the reason I waited was serendipitous – so I can try your take on it. Look’s delish – and I like the farro substitution (if only because I always have that on hand!). It has been so cold and snowy here in the northeast, I see no problem with eating soup all the time! This sounds like such a healthy and hearty soup! Well I hope your soup kick continues because that cabbage tomato soup sounds pretty good. I am sure we all would forgive you for posting three or four soup recipes during January and February. I have told my husband 3 times in the last week that I am craving a mushroom soup. Is this a sign? I must make it. I love beef broth as well. It is a staple in my kitchen. Thanks for posting this one – it looks right up my alley. I’ve been craving soup lately and we adore mushrooms, so it’s made this week’s menu. om to the nom! looks bomb diggity do! Soup is the best! I never think to put mushrooms in soup, and it’s so nice to see such a delicious-looking recipe for soup that isn’t tomato, chicken noodle, or clam chowder. Thanks for this!! Mushrooms are amazing! I’d love to try this soup sometime, and you’re right. Unfortunately, many amazing dishes don’t looks so amazing! Love that you had 2 weeks straight of soup – in this cold and snowy NY winter I can do just about the same! I’m glad you are back on good terms with soup so we can all get these great recipes. This soup looks divine! However, I do have one very weird question: If someone really didn’t like onions (yes, I know I’m strange), how much would it impact the consistency of the soup? I like the flavor of onions, so I’m happy to substitute onion powder, but I really do not like the texture of onions. Help?? DessertForTwo — Funny! I was just describing to my husband a farro recipe with meat that has me craving it on description alone. Perhaps I should get to it? Another mushroom soup recipe in the archives — More cream (I often use half of what’s suggested and miss nothing), but utterly amazingly delicious and a huge dinner party hit, from Balthazar. This recipe looks delicious and I am always interested in different recipes for soup. It is quick and easy to make and with the freezing temperatures in London it is a great winter warmer. Soup is great, filling and healthy thanks for posting this! 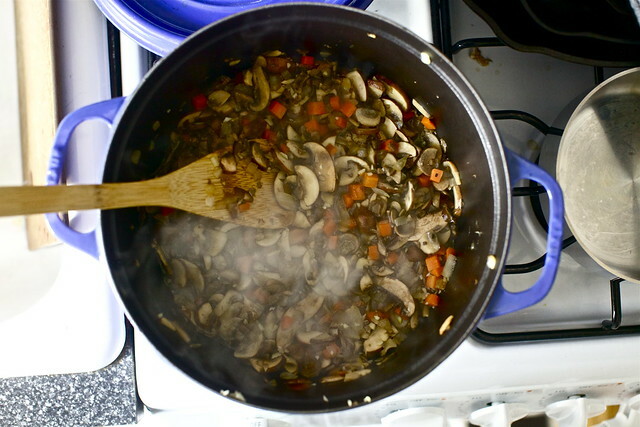 Mushrooms and Farro and Broth – OH MY!!! First time commentor (?) and new lover of your blog, Deb! (I don’t even know what a blog is, but yours is educating me! Soup in January… it is perfection. But even I couldn’t have it for 14 days in a row! From the Jacob picture: is that an egg carton waiting for recycling day or are you an incredibly brave woman leaving eggs on the floor with a 15 month old baby running around?! life and kitchen –Needs to be taken downstairs for recycling (that’s like two hours worth of mess). The process gets sped up quickly when Jacob starts playing with the garbage. Ooh, yes, we love a soup very much like this, often. Try it, sometime, with a spoonful of miso stirred in, and/or a dash of Lea & Perrins. Can’t taste them at all, but oh my, the umami! They do a little tango with that porcini bass note. I’m obsessed with farro right now! I’m totally making this this week! A question, though, Deb: do you think I could substitute wheat berries for the farro? It’s what I have on hand, and not having any idea what farro is (-shame-), my tentative guess would be that it’s kind of along the same lines …? Can’t wait to hear about the tomato and cabbage soup. I’m picturing something like I got from a Polish deli here in Chicago once–rich with beef broth and mushrooms and tangy with sauerkraut. I tried to recreate it myself and failed miserably, but I have faith in you! Maggie — If it cooks in a similar amount of time, should be fine. Julia — No need to pre-soak. Deb, I have an embarrasing crush on this soup. I thought I found this blog as a link from yours I think… It’s seriously good stuff. Our local Italian deli had this as the soup of the day yesterday. Wonderful! Now I can make it myself. Thanks Deb! “sherry cream”? What’s that? sounds delicious. Is the tomato-y cabbage soup you made the one that was in the NYT a couple of weeks ago? I made it, and liked it enough to tweak it, but haven’t gotten around to it yet. So, if you do decide to get it ready for prime time, I’d definitely be interested! Jess — It’s not. The photo made me drool but 1/2 cup of brown sugar sounded all sorts of wrong to me. Also, ketchup doesn’t generally offend me but it has a lot of sugar in it so I imagined the soup would be very, very sweet. Did you like it? Because again, that photo looks amazing. Looks amazing! My hubby will go bananas if I add one more type of vinegar to our way-past-capacity tiny kitchen pantry…think red wine vinegar or champagne vinegar would do instead of sherry vinegar? Mmmmmmm! Mushrooms, I love mushrooms! Can’t wait to try. We brought back a half kilo of dried porcini mushrooms from Italy this summer – from the weekly street market in Cortona. The lady at the stand got them straight from a huge barrel and shrink-wrapped them for us (along with a kilo of parmesano). Luckily, we still have some left, although the first batch went into the New Years’ eve lasagna. This is tomorrow night’s dinner. Have you ever heard of putting a rind of parmesan into the soup to give it that special flavor? Might just try that, too. I dont really love soup. Even the ones that sound good. Even when I’m sick. I bought ingredients for the blackbean soup on your website but have yet to make it and the ingredients are going to go bad. But this sounds delicious, so hopefully I grow the balls. Here’s hoping. By the way. If you love soup you must try Trinidadian Corn soup. It is very flavorful and I’ve never heard anyone complain. Typically eaten around carnival time (feb / march) or in the wee hours of the morning after an epic fete (all night party w live music, food, and all sorts of bacchanal, etc). Even non-soup-lovers and vegetarians like it. If you cant find a recipe e-mail me and I’ll get one for you. If you don’t love it, I will cook you anything you want to make up for time lost – and to your specifications too. Hooray! I’ve been needing some new soup inspiration since I’m so bored with all of my regulars. This is just what I’ve been looking for! If it wasn’t nearly midnight I’d be soaking mushrooms and preparing a stock. Thanks for posting this, I’ve been searching for a good mushroom soup recipe for weeks. Can’t wait to give it a try! you have changed my (cooking) life in so many ways and you have absolutely no idea how much. It is so hard salivating over your winter dishes while we are sweating in peak summer here in South Africa and then again your lovely light summer dishes when I am shivering, but I am rather good at trying out the print-outs a couple of months after the fact! Just a tip – don’t know what the case is over there, but buying dried porcini, basmati- red or wild rice or any such item here at “normal” stores cost the earth. These “exotic” items cost a fraction of the price at those funny Chinese grocers that are tucked into odd corners. Delicious looking soup! I’m in love. Have often wondered — is Farro really just barley, but more expensive? I keep meaning to buy some and do a taste test. Is there a big difference? I often substitute wheat berries for barley too — can’t tell the difference. This sounds wonderful! And I have dried mushrooms from The Spice House in the freezer. Deb, could you please recommend a brand of sherry vinegar? I still haven’t found one I like. Another beautiful and undoubtedly delicious meal! And a refreshing version on a classic fave. This one is also a great source of vitamin D – a vitamin hard to get in (this especially snowy) winter! Did you know mushrooms are the only plant source of vitamin D. Thanks Deb! I need more soup in my life. I think I’ll try this! This looks so delicious and satisfying! I love farro too! Haha. “Gateway Drug” is a good way of putting that. I tend to get into moods where I’ll only cook one type of dish for a couple weeks. Eventually I overdose and have to wait a couple months before I can even consider eating it again. Sounds delicious – especially for this time of year! Always glad to see soups without too much cream/fat. Nice recipe. I can agree with you on nothing beating a good soup. I used to be a disbeliever as well. Your potato soup was one of my favorite recipes on here, so I can definitely see how that is a gateway drug to other soups haha. Perfect for this freezing weather. This soup looks fantastic…love a different flavor soup! I have not used Farro yet but have seen it in a couple of recipes and want to give it a try. That sounds great. I love the sherry-mushroom flavor combination. What a great pairing – farro and mushrooms. Perfect for a snowy day like today! I made this last night for dinner and my husband hasn’t stopped talking about how wonderufl it was! I don’t do that well with grains and I get confused what is what, but I am going to give this one a shot! this looks like the best thing ever right now. i wish my husband liked mushrooms! do i wanna make this soup!! My husband and I are big soup for dinner people so this is perfect. Actually, your white bean/ham/kale soup is one of our go to weeknight dinners. I don’t think you were a huge fan of it when you made it ;) but I skimmed all the comments and incorporated a bunch of the recommendations and now we can’t get enough of it! Can’t wait to try this one too. DANG, that looks good. I’ve never used farro, but I’m a huge fan of porcini mushrooms, so this seems like a great starting place! This looks delicious! Do you ever do any gluten-free baking? I also am on a winter soup fix and did try the cabbage soup recipe in the NYT. It was sweet, and required a bit of tweaking, but the end result was fabulous. Reminded me of my grandmother’s stuffed cabbage (not so different from your posted recipe, I’m thinking), so I’m seconding the vote for a prime-time version of cabbage soup! Farro is something I have never cooked and possibly never eaten. This is the second time I have seen it in a recipe in the past month and I think I may have to give it a go. I’ve been on the lookout for a divine beef and barely soup recipe and I think this one will be a good variation to try. You are right; it’s all about starting with a rich homemade broth. Since you’re on a soup kick, have you ever tried making tortilla soup? Nom nom! I can not wait to make this!! I can not think of anything better for my winter blues right now. Deb, just a little tip to try next time: make it without chopping the dried porcini…I like it better as you can taste better porcini flavour and texture! In Eastern Europe we use a lot of dried wild mushrooms in different dishes. We make a wonderful vegetarian dried porcini soup with cream but we never mix dried mushrooms and tomatoes because both of these ingredients have very distinct flavors that compete with each other. I am curious about the impression of those who will try your recipe. Just another great recipe of yours that I will be happy to try! And what great soup weather we are having for this wonderful stuff! I love mushrooms, and this soup is also a dark broth(if you go that way), and hearty bites, from strong textured grains? Oh my, I think I’m in love. Yum. Just one question: how do you strain liquid for grit? Coffee filters? Amanda — I have a fine-mesh strainer. A coffee filter would also work. I cut the brown sugar in half in the NYT cabbage soup and it was still too sweet for my taste (no matter how much my boyfriend tried to convince me that cabbage soup is supposed to be sweet and sour), so for me, the recipe still needs some work in that respect. That said, I liked it enough to use it as a jumping off point. And yes, that photo was absolutely drool-worthy. I obviously succumbed to it. …This perfectly describes my version of your ‘baked potato soup’. After the second warming-up however, I have to say that I really enjoyed it. The addition of some rosemary really did the trick. I reckon it’s time to have a crack at the ‘mushroom and farro’ recipe. I made this tonight, but I used one cup of rice instead of farrow. Oh, and I forgot to add the sherry vinegar. It was really delicious, despite my changes. My husband had two bowls and is looking forward to leftovers tomorrow for lunch. I’m not much of a soup person myself, but making this into a stew by doubling the rice was perfect for a cold winter night. I have this soup bubbling away on the stove as we speak. We’ve been eating soup nearly exclusively this winter and I love it! sigh. You had me at mushroom. The soup looks great but what I came here to say was: thank you for that Everyday Yellow Dal recipe! I have made it a bunch of times now, and my husband and kids love it. I serve it with brown rice and raita and some kind of sauteed green for the grownups. It’s so tasty and easy and it’s really nice to have another recipe that counts as a tried and true family favorite. Which, with my kids, isn’t always easy to find. So thanks again. We are soup junkies at this house so this will have to be made. And I am embarassed to have noticed today that 90% of our favorite and most often made meals come from your site. I also rave about your site to anyone that is looking for good recipes…. I think I’ve become a Smitten Kitchen groupie… and my mother had such high hopes for me. Oooh, how did you know? I just bough a huge bag of farro and have been trying to decide what to do with it! Yum! That sounds like an excellent soup. It really is funny how once you have something that you haven’t had in quite some time and end up truly enjoying it, you can get mildly addicted to it. That happened to me and stew a few weeks back. If you’re looking for a unique new soup to try, I’d recommend avgolemono. It’s a Greek egg-lemon-chicken soup that is rich and refreshing and entirely wonderful. You mentioned that you used Farro, so I did the same. Unfortunately, farro takes a WHOLE lot longer than bulgur, which I wish I knew. It takes a lot more time. It would be helpful for instructions for the ingredients used. then again, perhaps I have not had it at a super steady simmer. Ohh this looks delicious! We’ve been having a crazy winter storm over here, and this looks like the most perfect, comforting soup to make for dinner tomorrow! I just made this tonight, and it was delectable. I subbed a lb. of ground beef for the farro (blame my father), was too lazy to look for out of place dried ‘shrooms at the store, and my whole family loved it, including my 10-year-old sister. I worship your site now from the many first round successes I’ve had. Though I’m only 15, I know a good quality site when I find one. I love that this isn’t a creamy soup. Too many mushroom soups get drowned in cream and the flavors aren’t let to shine. The deep color of it (probably partially from the tomato and the beef broth) is absolutely stunning too. Can it be done from fresh mushrooms only (without dried ones)? I’m curious about that, too. I can’t believe how expensive dried porcini mushrooms are! I made this last night for dinner as it’s so cold here and I was totally inspired by your post. It was so delicious!!!! I did use red wine vinegar instead of sherry vinegar since I didn’t have any sherry vinegar. I can’t imagine that it made a huge difference. Also, used pearled barley rather than farro. It was absolutely perfect! I fed four adults with it and there were zero leftovers. I think next time I might use a couple more cups of broth since the fresh french bread we ate with it was used to soak up soup and some of us ended up with piles of mushrooms rather than mushroom soup about halfway through. Thank you so much for a fabulous recipe! I have been hooked on soups at an early age when a Romanian grandma would brew them daily in a cramped kitchen with a toddler sitting and watching in wonder the magic of making soup happen. Mushrooms and farro sounds like a delightful combination. Keep on going with the love for soup! I am a first time commenter and wanted to let you know that I read this just after you posted, and immediately went to the store for mushrooms to make it. Thank you for the inspiration and recipe. Yumm! My co-workers make fun of me because I eat canned soup every day for work, so when I saw this post, I had to try it! I made this last night for dinner and it was very, very good! I think maybe next time I will put it in the fridge immediately after I make it because I left it out and the farro soaked up a lot of the juice and wasn’t really soup anymore! Super tasty though. Thank you for a great, easy recipe. Just finished making this. Perfect thing for our umpteenth snow day. I love soup – eating and making it. But this is one of the best! I had barley on hand so used that instead. Mixed shitake and creminis for fresh and a mix of dried (Costco). I can’t get over how good my apartment smells! This sounds yummy! I can’t wait to make it! I am sharing a link to your site on my blog tomorrow. Good luck at the Bloggies!! I’ve never been a huge soup fan, but I’m currently traveling in Morocco and I have to recommend some Moroccan soups to those looking for a soup-conversion experience. When I arrived, I’d at least heard about harrira – yummy tomato soup with parsley and chickpeas, ever so slightly spicy in its best incarnations – but the best by far was a magical pumpkin soup (of which I do not even know the name… whoops). It’s made with copious quantities of ginger, carrots and zuccini, a few tomatoes, and a tiny splash each of olive oil and millk – and it is amazing. It is so much better than the sum of its parts – this from someone who doesn’t even much like any of those parts on their own – and probably preposterously healthy. So Deb, if you decide to keep the soup-hits coming, please – consider making some pumpkin-ginger soup. I am always on the lookout for a new delicious soup- especially this time of year! I will have to try this one! I made this tonight with pearl barley and it was spectacular! So amazing that I’m glad my husband doesn’t like mushrooms because there’s more for me! My daughter snagged a bowl, too and gave it a hearty thumbs up. I increased the barley to 3/4 cup, and added perhaps an extra half pound of mushrooms, but otherwise left it as is. I am looking forward to feasting on this again tomorrow while I watch snow falling outside my window in central Texas! For anyone on weight watchers, the recipe (as Deb has written it) is only 8 points for a 2 cup bowl! I added 2 tablespoons sour cream and a dash of dill to the second cup for an extra point of deliciousness! Thanks, Deb! Oh, and that little monkey of yours just gets cuter by the day! Gah! Melt my heart in this cold weather, why don’t ya! I swear, you must be reading my mind! I have hated soup for most of my life for all of the reasons you listed above. Until I came down with what I can only describe as “the plague” about three weeks ago, and now I’m downing soup like a crazy person. I find that the clear, simple, flavorful soups are the best (and the only meal me, my diabetic-bad-foods-loving dad, and my vegetarian-reduced-carb-dieting sister can agree on). Tonight I made onion soup, this weekend I am sooooooo making this! I agree with you, a good soup is just…da bomb. Made this last night and loved it! I added two potatoes, chopped, in the last 10 minutes or so. Only had 2.5 cups chicken stock, so used plain water for the rest. Used pearled barley. I thought it a bit acidic at first, but after a couple of hours (cooked in advance – one of great advantages of soups: they only get better with time!) the flavors settled down and mingled nicely. We ate it with sour cream and dill. My 13-month old loved it! thank you, Deb, for another great recipe! My husband grew up eating soup all the time so he’s thrilled whenever I make a big pot of it. He’s not a farro fan, though, much to my regret, but he does love absolutely everything mushroom related! This looks great and will try it because I love Farro – but aren’t farro and spelt the same thing rather than alternatives? I found you through another friends blog back in October with the spiced applesauce cake and in setting up a link and passing on an award- I found the baked potato soup yesterday… It has been extremely cold in Phoenix and that just hit the spot! I have loved mostly the desserts- although I am on a mission to find simple, delicious and nutricous food to cook. Keep it up! My recipe book is getting stretch marks. Thanks! Looks good for the soul. This dish looks lovely! I cannot wait to try it buuut as this is superbowl weekend, do you have any “dude-friendly” dishes? I do not have much cooking experience and would like a dish that I could whip up quick and still impress the crowd (hopefully more than all of the girlfriends that are baking/cooking experts!) Thanks! Love your website. That is the best looking mushroom soup ive ever seen, and by the looks of it you are or you have one of the best photographers and backdrops in the business. Great pics, now I can’t sleep and want some of that soup! Great idea to layer the mushroom flavor by using both dry and fresh mushrooms…and a shot of sherry never hurts. Thanks for offering a vegetarian option for the broth. Awesome! Had it with Lobster Mushrooms tonight and it’s delicious! It makes all those days of mushroom hunting come back to me 6 months later. It’d probably be great with Morels and Chantrelles as well. I love it! I just made this tonight and it’s amazing! I’ve recently become a great lover of mushrooms since making your mushroom lasagne several months ago.Your Mushroom Bourguignon? Sublime…and those roasted ‘shrooms in the garicky puddles of butter? awesome. Now this..OMG. Thanks Smitten for sharing your gorgeous, inspirational and delightful kitchen. Made this last night and just realized I forgot the sherry vinegar at the end. I am still on the fence about sherry vinegar and do wonder if I just haven’t found a good brand. Would really, really appreciate anyone’s recommendations for a good brand. Anyway, this is deelicious! The only farro I found was also called spelt on the package. It cooked fairly quickly. Thanks for yet another winner, Deb! Oh, this looks so good! It is the perfect comforting bowl of goodness. I made this the night before last, and we ate it last night. It was hearty, chewy, rich and delicious! I threw in the end of a bag of baby spinach, and that was good, too. I am having the last bit for lunch today – and I can’t wait! I love a really good soup recipe! Especially a really good vegetarian soup recipe! There are too few of these. I’ve never tried cooking farro before. But, this looks great! It’s a cold day here in Cali and this recipe looks like a winner. Thanks. Mmm.. Love soups. I wonder if this would taste great swapping farro with lentils or any other condiment suggestion? Love to see you making soup, as that is my specialty and personal favorite! I noticed a bunch of readers at The Kitchn tried to re-nominate you even though you were already a winner in a year past. You’re still my tops (and apparently all of theirs, too)!! I skipped the sherry and sherry vinegar as I hate sherry, and substituted a 1/2 cup of white wine instead. I skipped the beef broth and used water with Rapunzel vebetable bouillon cubes as I am don’t eat meat. I also skipped the tomato paste as I did not have any and I was not going out into that 20 plus inches of snow to get some. And I accidentally doubled the pearled barley to one heaping cup. But besides all of that, this soup was so so so good! Really hearty with lots of flavor and depth. Delicious! Will definitely be making again. so, after whining about the farro cook time, I realized I should’ve put a sock in it til I actually ate it. SO delicious and the add on time from the farro actually just increased the flavor. I topped it with big hunks of bread, then shredded aged swiss and gruyere and baked for a few minutes. Oh my, what a hearty treat! Deb, do you add in the soaking liquid from the porcini mushrooms, or just toss it? OOPS– my bad — just read your recipe more carefully and you answered the question already! This sounds excellent. I’ve been eating a lot of vegetarian chili in the past couple of weeks, so something a little more slimming is definitely needed (also to balance out all of the ice cream I’ve been making). Thanks for the inspiration. I made a heartier soup by quartering the mushrooms and adding only 4 cups of stock instead of 6. Really good! Ive got some of the non-quick cooking farro laying around. Think I ought to cook it first, and then add it? This stuff seems to take FOREVER to cook! Wonderful with chewy farro. Glad to hear it freezes well! Yum! If I were to use fresh porcinis, about how much would that be? Made it Sunday for dinner. The men at the table asked for seconds right away. My husband enjoyed more of it for lunch next day, adding crumbled feta. Not having sherry vinegar, I used white wine vinegar. This was my intro to farro – it’s really a lot like barley, but less ‘gluey’. Loved the soup myself. All gone now. 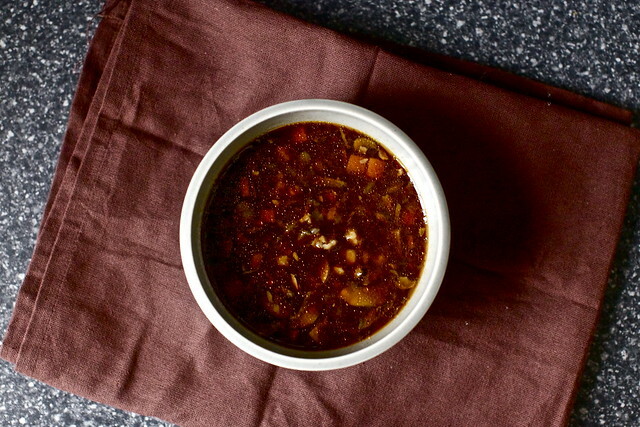 While making this soup this afternoon, I reached into the fridge, pulled out the tube of tomato paste and squirted away – only to realize that what I had actually squirted into the pot was harissa, not tomato paste! But I added the tomato paste and proceeded, and I have to say – it’s pretty great with the bit of spice! I decided to try to overcome my immense dislike of mushrooms with this soup, and I may have partially succeeded. The flavor is good, but the mushroom texture still puts me off a bit. I didn’t have sherry on hand, though I don’t know how much that impacted the taste. I’d like to add some spices to this…and possibly make a (soy-)creamy version. I made this with barley and it was FANTASTIC. Great layers of flavor. Thanks for sharing! Yum! This was great – doubled the farro like you mentioned, subbed chicken stock for beef and red wine for sherry since that’s what I had on hand, and it came out delicious! Sherry vinegar + mushrooms = heaven. And I’ve been meaning to try my hand at some farro. Thanks! Oh my goodness, I have just found your blog and I think I love it. I will try this at my home. It’s on the stove now simmering away. . .can’t wait. As for the Sherry–do you store it in the fridge?? Thanks! I store sherry at room temperature, with the other booze. This soup was very good! I used red wine for sherry wine and red wine vinegar in place of sherry vinegar. I doubled the farro, which made the soup very thick and chunky, which is great if you like this kind of soup. I added some spinach in at the end and it worked well. I had some leftover sour cream and following your suggestion – I topped it with a dollop. I would definitely recommend adding it in. It harmonized the balance of flavours. This soup came out awesome!! I added more vinegar than the recipe calls for, but wow is it good!! Deb – Finally got around to making this soup this week. SO delicious. I made a few modifications: 1) since I couldn’t find the dried mushrooms, I used 6 oz of Portobella instead and I think they really added to the flavor 2) for those looking for a sherry substitute, I used a tablespoon of white wine vinegar, a few tablespoons of cherry juice, and a little bit of sugar. Thanks for posting! Love your site and I’m excited you’re writing a book! I made this soup this weekend. Quite tasty BUT I’ve cooked farro once or twice and this time it did not puff up like the previous times. Should I have cooked it separately first? Thanks. What could you suggest as a good substitute for the farro? I’m gluten free, but this soup sounds delish. Brown rice, perhaps? Any suggestions for substitutions for the carrot (I’m not wild about them)? Or should I just leave it out? Made this multi layered, rich soup tonight. Wow! Used vegetable and mushroom stock and added a bit of rosemary. I am sorry that I didn’t add the little bit of tender swiss chard left in the garden. It would have been perfect. Not that is wasn’t the way that it was. My husband asked me to put it on the regular rotation. Served it with a nice salad and some dense bread–along with the suggested dilled sour cream (soy sour cream) to spread on the bread–not in this fabulous soup. oh my golly, you were not kidding about the low-sodium broth. the salty! what have i done?! Made this soup last night! OMG! It was fantastic. I used freshly made chicken broth and added mushroom-soaking liquid in. I did not have any sherry so I used sherry rum pappers sauce I brought from Bermuda forever ago. That gave the soup a nice kick! Thank you Deb. Your blog became my recipes central, it is far more superior from all others! Yum! Made this with barley and fresh mushrooms – not button, the brown ones that look slightly gourmet but are not portabello. I obviously don’t know my mushroom terms very well. I also used red wine instead of the sherry and added some chopped parsnip. So hearty and good! Absolutely delicious, both as dinner and as lunch leftovers. I can’t get over how savory and filling it was, despite being so, so healthy. This recipe is a keeper! This is a mother/daughter team and we are so excited to create this masterpiece that will compliment our Italian themed dinner for three! Buon Appetito & Salute! Just made this recipe and it is absolutely delicious! Made this tonight – yum! Next time, I’ll add 2x farro and black pepper. It reminds me of the original Moosewood Cookbook recipe for Mushroom Barley Soup. I made this soup tonight with shiitake and cremini mushrooms and swapped the sherry for white wine and red wine vinegar instead of the sherry. I couldn’t find dried mushrooms so I just added some water to the beef broth. This soup was so good! I only made it for me, and ended up eating the whole pot (I did reduce everything). Will be making this again. This is just a wonderful soup. In the interest of using up old bottles of seldom-used ingredients, I swapped in sweet vermouth for the sherry and apple cider vinegar for the sherry vinegar with no problems. In addition to a potato leek soup from Bon Appetit, 1992, this will be a standby in my kitchen. Thanks, Deb. I love dried mushrooms but sometimes find them still gritty in the recipe. I have rinsed them after soaking and still find odd bits of grit..all it takes to turn me off. I also drain the soaking liquid through a coffee filter which seems to take forever..any tips? Brenda — The coffee filter is the usual way to remove grit, so you did it correctly. hi deb! I live in Israel and have not seen Sherry here (maybe I didn’t look hard enough), but what is a good substitute? thx! Sherry is a fortified wine. Other fortified wines include marsala, port, vermouth… I think any of them would do. Or, you can skip it. There’s a ton of flavor here, even without it. Wonderful soup, Deb! Thank you! I made this last night – sing ho! for the advent of fall! I used “Dinkel” (according to wikipedia, that’s the name farro goes by over here) which I precooked for 20 minutes in the pressure cooker. Nice texture – done, and yet not at all mushy. Curious about that, too. Does it really do much to sautee the mushrooms or just add to the mix when making soup? So delicious and perfect for winter. I already made it once and I’m going out to buy more mushrooms after I get off work! Great recipe, thank you Deb! Made this twice in two days. It is wonderful. With a dollop of sour cream or without, with a handful of spinach in the bowl or without. You can’t go wrong. Thank you. I made this soup, following your recipe, and it was a huge success! I added a large teaspoon of salt and plenty of freshly cracked black pepper to season, as the chicken stock I used was not well-seasoned, and served the soup with kale crisps and chives on top and paprika socca. Thank you for a lovely recipe…much enjoyed by everyone at my table! Dumb question, but may help some others as well. 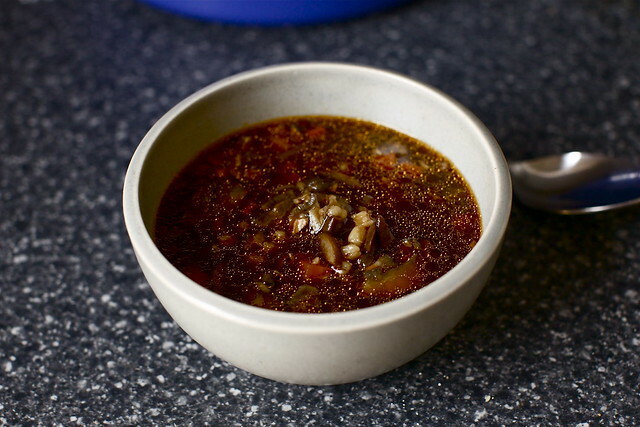 What can you do to salvage the soup if you misread the recipe and added 1/4 cup of sherry vinegar instead of sherry? I didn’t want to throw out the soup, so I just added more farro and broth to make it less sour. Will see how it turns out! I made this last night on a quest for a nice brothy and meatless soup. It was a lot of prep for me but alas there is a lot of chopping involved with soup. I went out of my way to track down the different mushrooms and sherry, although I read a lot of comments saying that substitutes worked perfectly well and this soup is not finicky. It was delicious! I think the leftovers might need some additional beef stock as the barley looks like it’s soaking up the broth. Very excited that I stumbled upon this recipe, but was wondering about the use of dried mushrooms as opposed to fresh mushrooms. Is there a big flavor difference between the two, or another reason why you would suggest using dried mushrooms? The reason porcini are usually dried is that they’re very expensive and not grown everywhere. 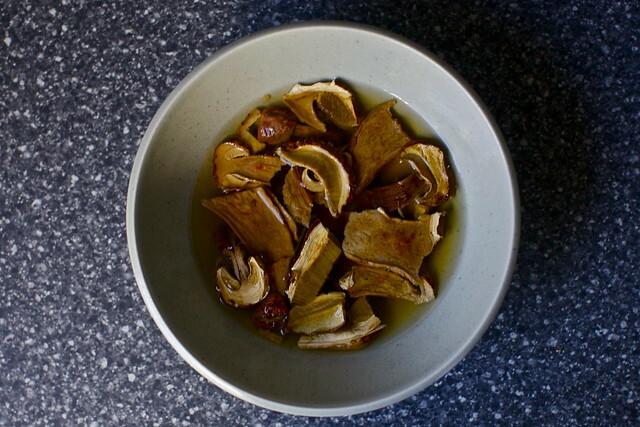 A couple dried go a long way to adding a tremendous amount of flavor to the soup. If you can find them, I think you’ll be glad you did. If you can’t, the soup should still be delicious. I made this a few nights ago, and it was perfect! So rich and deep-flavoured, and very comforting. Thank you so much for this recipe! Made this today after seeing the recipe pop up on twitter, simply delicious and exactly what the taste buds were looking for today. I used barley instead of farro and didn’t have any sherry so I substituted white vermouth. I also had some fresh thyme and threw that in about 10 minutes before it was done. This will definitely go in my rotation. I’ll remember to pick up the bottle of sherry my next trip to the liquor store as no doubt that will make it even tastier. I love you, Deb Perelman!!! Smitten Kitchen has been my guilty pleasure for years. Thanks for following the gifts God has given you and making so many hearts and tummies sing. My daughter and I plan to see you in Portland next month!! What is the symbol at the top of this page, btw? Just made this. Delicious!!! :) Substituted sherry (not available here) for half white vine, half apple cider vinegar with a teaspoon of moscovado sugar added in. No beef broth in the freezer so vegetable broth it was. This is absolutely coming into the rotation this winter, can’t recommend enough. Made this two nights ago and just eating the leftovers. It made the whole house smell incredible! I like it even better after it’s sat for a day! I added a tad more sherry and some red wine, plus served with some gruyere cheese on top. Rich without the meat. Yum. Could you add beef to this, and if so how would you suggest doing so? Brown some chuck stew meat and let it simmer with the soup? That should work. Or perhaps some sausage. Surprisingly “meaty” and delicious even with several substitutions. The sherry was too far back in the liquor cabinet ( first world problems) so I used Marsala. Couldn’t find dried porcinis so I used mixed dried mushrooms. And applying the theory that acid helps most things I served with lime wedges which made it perfect. Have you tried this in the instapot? Great recipe. I used to make something similar but instead of a grain (barley, farro, spelt, etc. ), I added a can (or 2) of rinsed and drained low sodium cannellini beans. Adding the mushroom soaking liquid takes this recipe to another level. The ‘earthiness’ of the soaking liquid adds a meatiness and umami depth that cannot be duplicated. Last but not least, I could easily see substituting Marsala for the Sherry (especially since Marsala is a staple in my house whereas Sherry is not). I can’t believe I missed this soup the first time you posted it! Now I’m wondering if you have made it in your Instant Pot, and if so, what was your cooking time? Suggestions? Thanks, love your blog! It’s good! I added spicy tomato jam (made from the garden) and subbed some miso instead of bullion (didn’t have broth on hand). Delicious version of a winter staple. I used farro as suggested and homemade chicken bone broth in lieu of beef. I must have run out of dried porcini, so I subbed dried shitaki and some other dried Chinese mushroom I had. And I used about a cup of dry mushrooms as they were already soaking when I rechecked the recipe for the correct amount. More mushrooms never hurt anything! The sherry vinegar I think is what set this recipe apart, giving it another level of flavor, which was more sophisticated. Any suggestions or cautions for freezing this soup? I’m heading out on a camping trip and think this would be perfect warmed up for dinner! I made this using freekeh and chicken broth and omitting the sherry vinegar which I didn’t have. Somehow I was not happy with the taste and kept trying spoonfuls over several hours until I understood what I was missing: two tablespoons of soy sauce worked the magic! A bit of hot miso paste (-> gochujang/sambal manis) made it even better! I’ll definitely file this as an Asian inspired, hot soup and might even add some pak choi or bamboo sprouts next time. Do you have any recommended brands of beef broth with a true meaty flavor? Thanks! Not really, but Better Than Boullion concentrate is pretty decent if you otherwise watch the salt (it’s very salty). I instant pot-ted this last night! Worked well. Sautéed the onion and carrots for a few minutes, added the garlic, and added the farro to coat with oil. Then added everything else and cooked on high pressure for 10 min, natural release for 10 min, then manual release. A faster way to make one of our favorite soups! Thanks, Emma, for the Instant Pot details. I love mine so much and will follow your lead. Nice! I look at every recipe now with a mind to convert to the Instant Pot. SK does it again! I wasn’t sure the effort of finding sherry vinegar would be worth it, but it really does make the whole thing so delicious! Made as directed, added a little extra broth as the farro absorbed a lot of liquid. This was filling and satisfying. Hooray! Skip it; there’s enough else going on. I suppose blended roasted peppers might be… close, but again, just don’t think anything major will be lost without it. Thanks for the Instagram inspiration! This came at the perfect time. We had all of the ingredients on hand and it came together quickly for a delicious dinner. I used shiitake and cremini mushrooms with a vegetable broth and went with pearled barley because that’s what we had in the pantry. We will definitely make this again. Really delicious. I only had about 1/2 pound of mushrooms (mixed) so I upped by a little bit the dried.Sophisticated flavor; adding the grain (farro in my case) is brilliant. Soooooooo good! And have plenty leftover for lunch today. I was looking for a recipe which included farro, mushrooms and black beans and came across this. How do you think the addition of black beans to this recipe would work? I have never done it, but I don’t think it would be unwelcome here. Made this for lunch on a fall weekend day and was an easy and comforting one-pot meal! Thanks! Deb, this looks amazing — I love mushrooms! I’m gluten free, so would a good substitute for the farro be rice? Suggestions? Thanks! Yes. Here’s a more detailed tip. I made this using chanterelle mushrooms and homemade chicken stock and my husband thought it was beef and barley soup. This is incredibly meaty and satisfying. I used oloroso sherry, as it was the driest thing I had on hand. We’ll be making this again. I’ve been meaning to make a version of this for several weeks, and being an unemployed 25-year-old with a crappy sleep schedule, naturally I finally got around to it at one in the morning on a Wednesday. I added cannellini beans, a bit of celery, fresh rosemary and sage, a pinch of red pepper flakes, more garlic, some nutritional yeast for umami, and used leeks instead of an onion and white wine instead of sherry (which I didn’t have). I also made my barley separately (partly because I wanted to make something else with it, too) and poured the soup over it to make a sort of stew. So like most soup recipes I make, it ended up rather a different beast than the recipe I started from, but still a very good beast! :P I think it’d be hard to go wrong here. If I make this a day ahead will the Fargo soak up all the liquid? I don’t think so — it hasn’t happened for me, but a little extra water could loosen it if needed. i love mushrooms. i love farro. i love soup. i love this site. i did NOT love this soup. not sure what went sideways as i made it as specified, but it was a big disappointment. maybe it’s the sherry? it seemed overpowering, with the vinegar. just sort of sharp overall, rather than earthy and soothing. in the years i’ve followed SK this is the only fail, though; so thank you for that! Get some spices in there, yo. Oregano, thyme, basil, bay leaves, etc. This soup was delicious! So much more flavor than you would think based on the ingredient list. Will be making this again and again!